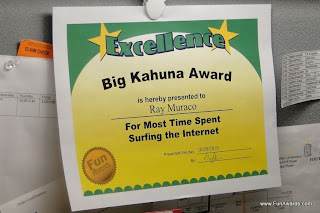 Looking for silly awards? Download the newly released third version of my eBook, "Funny Employee Awards: Your Complete Guide to Organizing a Humorous, Entertaining, and Rewarding Recognition Ceremony". 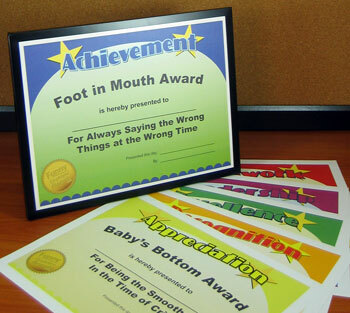 If you've tried to come up with your own ideas for silly awards, you know that the toughest part is coming up with ideas. That's why I've done the work for you. I assembled of team of top comedians and comedy writers, including a features editor from the New York Post and an Emmy-nominated writer from Saturday Night Live. My goal with this new version was to make the awards more accessible and with wider appeal. Just looking at the examples below, they could be used as silly sports awards, teacher awards, student awards, family reunions, high school superlatives - the applications are endless. The printable certificates make a great gag gift. Just add an inexpensive frame (think dollar store) and it's ready to present. Remember to bookmark this site and keep checking back for silly achievement awards, silly end of the year awards, silly office awards, silly recognition awards, and silly employee awards. These awards are perfect for any type of staff, organization, group, or business. The eBook has 101 professionally designed awards in PDF format that can be easily printed on the office printer. The awards poke fun, recognize accomplishments, and make reference to pop culture and cartoon characters. Download now and start using right away!